The meniscus is a cartilage-like structure that is found between the femur and the tibia. It is crescent-shaped and its main functions are to absorb shocks (along with the cartilage) and to distribute the weight and the forces that act on the knee. 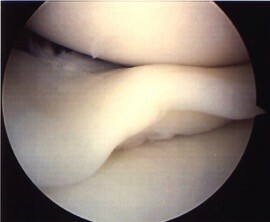 There is a meniscus on the inside and outside of the knee, which moves when it bends and straightens. A torn meniscus is usually caused by a combination of rotating movement with the knee bent. If there is a tear in the meniscus it usually leads to localised pain at the joint gap and sometimes a clicking feeling as the torn section snaps in the joint. The knee may also feel unstable. If the torn section gets stuck between the femur and the tibia this often leads to a blockage. The snapping of the torn section may also irritate the knee and cause swelling. Moreover, the quality of the meniscus deteriorates as we get older. The meniscus starts to present micro tears and it functions less effectively as a shock absorber, which means the cartilage is put under more stress: a typical process in the case of osteoarthritis. In such a ‘worn’ meniscus tears may occur as the result of a minimal trauma. An NMR scan is performed if an acute meniscus tear is suspected. If the diagnosis is confirmed keyhole surgery is often performed to prevent the meniscus tearing more or new blockages from occurring. 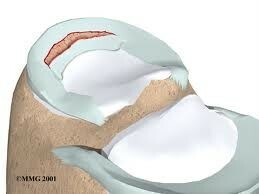 In the process a small section of the meniscus is either removed, or the section is stitched back in place. Keyhole surgery among patients with osteoarthritis and micro tears in the meniscus is often less successful. An injection could offer a solution in this case. 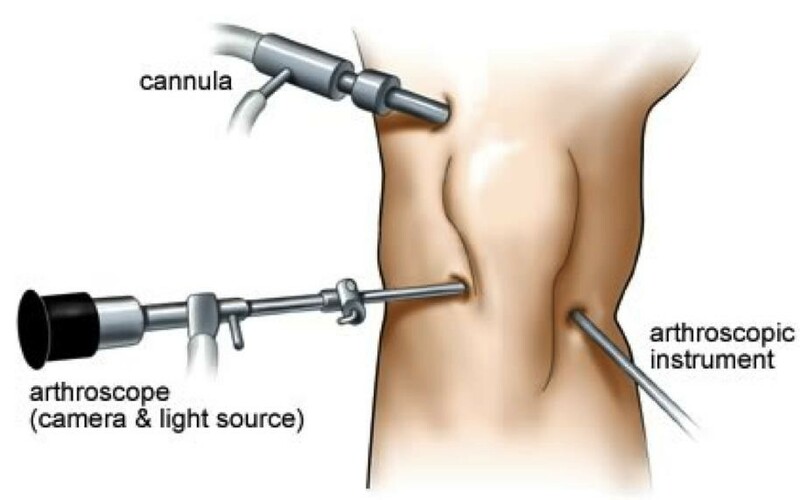 Keyhole surgery is a type of operation in which a camera and special instruments are used to perform the operation in the knee through small incisions. This technique is minimally invasive. It means the knee can recover considerably faster, which is a major advantage. Meniscus pathology, cruciate ligament injuries and cartilage injuries are treated by keyhole surgery. 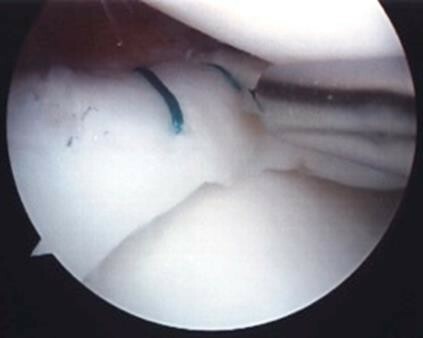 A torn meniscus is treated via keyhole surgery. Depending on the extent of the injury, the location and age of the patient, the torn section of the meniscus is either removed or stitched back in place. 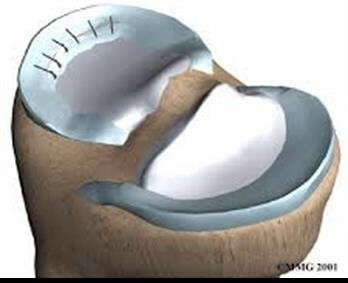 If the meniscus has suffered irreparable damage the tear is removed. In this process only the damaged section is removed, unlike in the past. The healthy sections are saved. This means a large part of the shock absorber is preserved and the risk of osteoarthritis is minimised. The partial meniscectomy as this procedure is called, is the most common arthroscopic procedure in the world, with positive results in over 90% of patients. A limited number of patients in whom the meniscus tear was very extensive and very little healthy meniscus tissue remained, suffer pain, swelling or accelerated cartilage wear and tear after the procedure. These patients are eligible for additional treatment such as meniscus-replacement solutions. 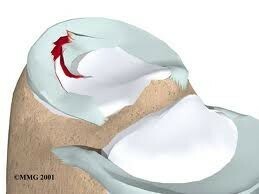 If a large tear is found in a zone with a good blood supply, your surgeon will opt for meniscus stitching. Frequently, it is only during the operation that a decision can be taken about whether the tear is eligible for stitching. There are several advanced techniques to achieve this and all of them can be performed by keyhole surgery. 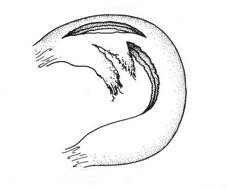 The choice of a particular technique is determined by the location of the tear. 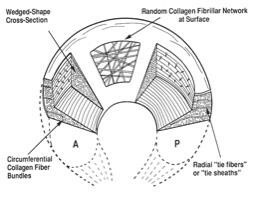 The major advantage of stitching is that the meniscus can retain its full function. The disadvantage is that the meniscus needs time to heal, which means certain restrictions will be necessary during the first three months after the operation. This is to give the meniscus the chance to grow back together. Recovery following a meniscus operation is generally very fast. Crutches are only used during the first two weeks, if necessary. Specific physiotherapy is not needed. The operation is performed in the outpatient clinic. 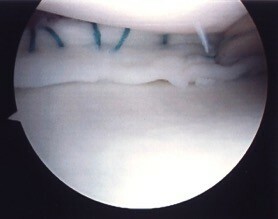 Meniscus stitching, as mentioned above, requires the necessary rehabilitation. Young people with a very damaged or totally removed meniscus that continue to suffer pain, could be eligible for a meniscus transplant. In this case the entire meniscus is replaced by a donor meniscus. The donor meniscus originates from a deceased person and must be the right size in order to be transplanted. This could mean a six to twelve month wait before a suitable donor is found. 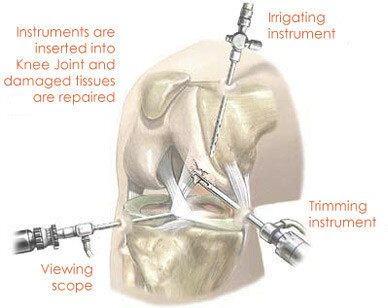 Nowadays, this advanced procedure can be performed by keyhole surgery. The great advantage is that a new shock absorber is inserted that protects the patient’s cartilage and combats wear and tear. The disadvantage of a meniscus transplant is that it goes hand in hand with intensive rehabilitation.